We’re celebrating Father’s Day with new patterns! Happy Father’s Day! If you live in North America, Father’s Day is this Sunday, June 17th. We’re celebrating by increasing our pattern offering once again – this time, we’ve collaborated with indie designers Fehr Trade and Toby K Patterns to make their menswear designs available in our shop! Even if you don’t have time to sew for Dad before the big day, I think it would be lovely to take him out for a coffee or beer (depending on his preference!) and dream up his perfect custom garment together. Does he cycle? Fehr Trade patterns would be an excellent fit for him – you could sew him the perfect cycling jersey, running top, or long underwear with just the right pockets and fit that he requires. Or perhaps he needs something cozy but stylish? Toby K Patterns have shared three of their stylish sweater designs with our shop. Each of their patterns include seemingly endless possibilities for customisation. Their sweater designs all include the option for cosy thumbhole cuffs and you can mix and match pocket styles. We have more indie pattern company collaborations lined up for the future. I hope you are enjoying this new wealth of choice in our shop! The above photos are just a sampling of the new designs – be sure to check out the others by scrolling through all of our PDF offerings! 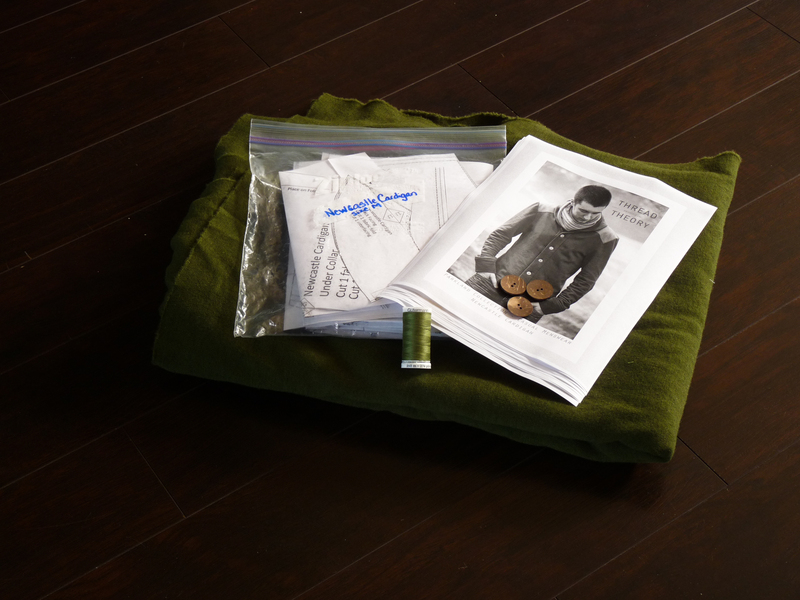 Thank you, to the always friendly and always collaborative indie pattern community for happily adding your menswear designs to the Thread Theory pattern library. Let’s keep this growing! Categories: Friday Posts, Thread Theory News | Tags: PDF Patterns | Permalink. We have received several emails lately from people who are excited to get sewing but are unsure of how to best assemble their PDF patterns. I usually refer people to our How to Assemble a PDF Pattern tutorial but have been increasingly inclined to send people to tutorials found elsewhere on the internet because our tutorial has been looking quite dated and a bit inaccurate of late! Matt and I made the tutorial very quickly three years ago one sunny Spring morning while we were simultaneously packing for a camping trip with my sister. She was waiting in the car for us to join her while we frantically uploaded the photos to the blog so that we could check the tutorial off of our to-do list before the weekend adventure. After three years and many improvements to the design and function of our PDF patterns, it is time to give this tutorial the attention it deserves so that it can serve its purpose as a clear guide for anyone who is new to working with our digital patterns! The pattern folder will likely be saved to your Downloads file. Find it straight away (before you forget where it has been saved!) and move it to a location on your computer where you will be able to find it in the future – perhaps in your Documents folder. The pattern folder is a zipped folder – this means that multiple files have been compressed into one tidy folder so that they take up less space. To unzip the folder with a Windows computer, right click and select Extract All. To unzip the folder with a Mac, option click and select Extract All. To access the files from an ipad, you will need the iZip app to unzip the folder. Read Me First – Read this first! This is a small introduction on how to assemble the Print at Home pattern. You don’t need to print this but it is important to read it and refer to the page layout chart when you are taping together your pattern. Instructions – You can either print these off or you can keep them on your laptop or tablet to refer to while you are sewing. Print at Home (depending on the pattern, there may be one or several of these) – The rest of this tutorial will explain how to print and work with the Print at Home pattern. Print Shop – Roll Feed – If you prefer to avoid taping or don’t own a printer, give this file to your local print shop. 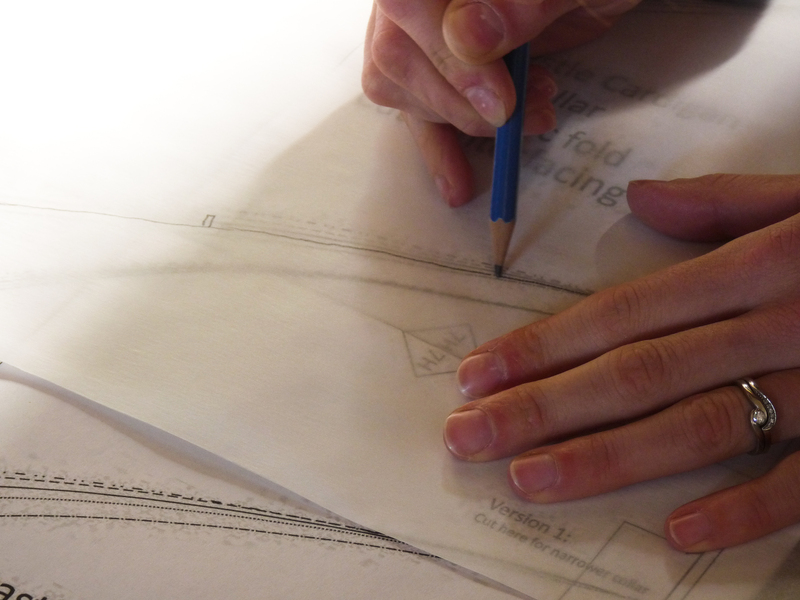 Specify that the file must be printed without scaling – the pattern pieces need to be full sized. The Roll Feed file is designed to work with 36″ wide wide format printers. These are commonly found throughout North America. Print Shop – A0 – This file can be sent to print shops that print on A0 size paper. Depending on the pattern you are using, you will likely need to tape one or two sheets together (for instance, a trouser leg is longer than one sheet of A0 paper and so it will be spread over two pages). A0 printers are common in Europe and Australia. As with the Roll Feed print option, make sure to specify that you would like the file printed full size (without scaling). Let’s talk more about using the Print at Home file. 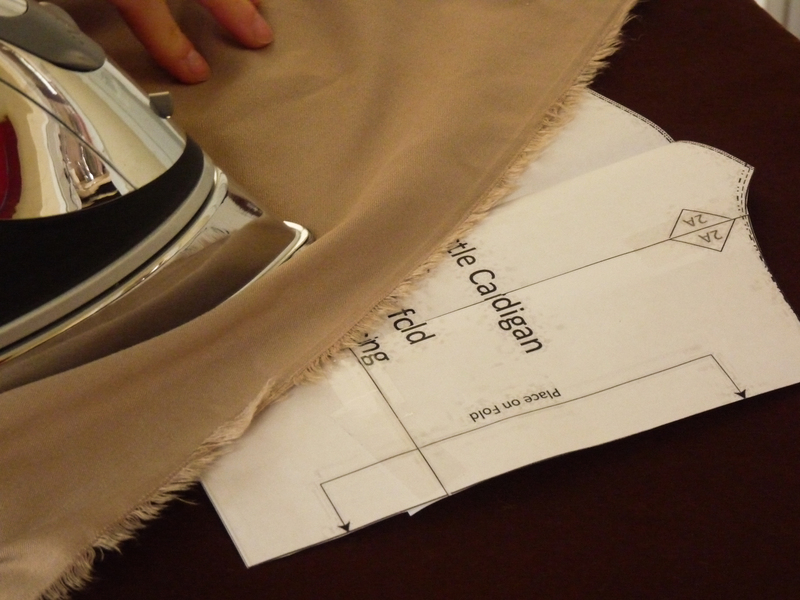 This option is very convenient – you can purchase a pattern and get started with the sewing process immediately! There is no need to wait for the pattern to ship to you or for the print shop to print your file. The entire process is in your control. While Print at Home PDF patterns offer advantages, there are also disadvantages to (depending on your perspective). Our Print at Home files are designed to print on Letter or A4 sized paper. This means that you will need to tape or glue together many small sheets of paper to prepare your pattern. This is a time consuming process. Some people dislike doing this and others (myself included) find this to be relaxing and even meditative. 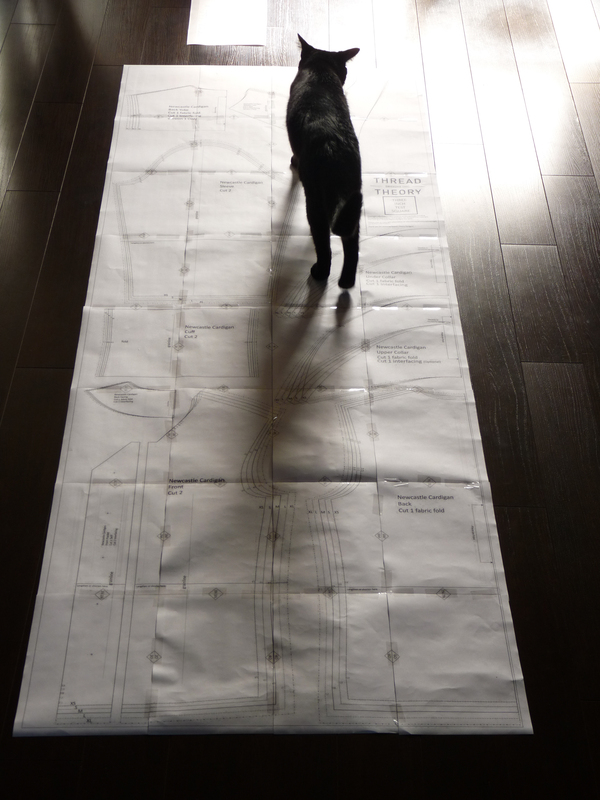 I like to spend the assembly time contemplating my fabric and design choices. Assembling the pattern allows me to familiarize myself with the pattern pieces – it has become part of my creative sewing process! To print the pages, open up your Read Me First document. 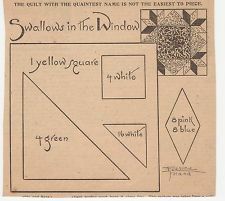 This page of instruction will tell you what page you will find the 3″ test square. 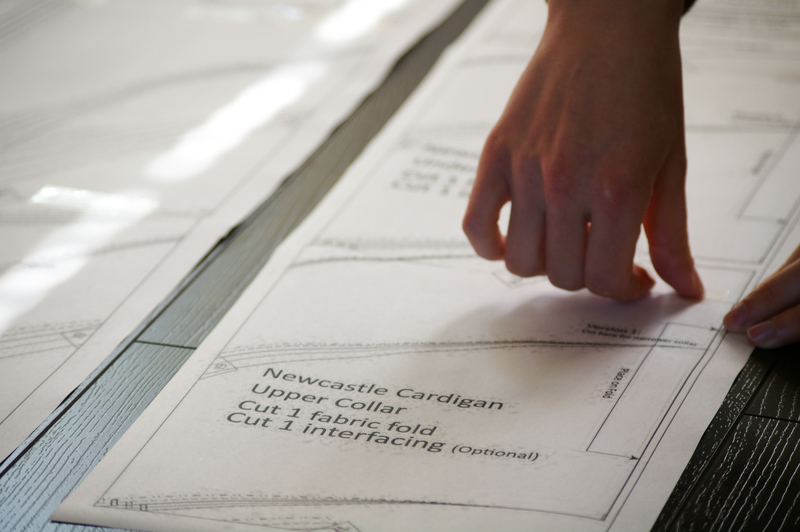 Printer Scaling: Ensure that ‘scaling’ is off so that your pattern pieces print at their full size. Printers tend to default to scaling so that the text or images fit nicely on a page of paper – we don’t want this when printing a sewing pattern! To turn off scaling you will likely need to deselect “Fit to Page” or “Scale to Fit” (depending on your printer software). Ensure that Scaling is at 100%. Single Sided: Also, if your printer has the ability to print double sided pages, make sure that your printer is set to “Single Side” printing…don’t print double sided! You will likely find this option in Properties. Econo Mode: If you would like to save ink/toner and paper, you can often find an “EconoMode” or “Draft Quality” printer setting that allows you to print with less ink. You will likely find this option under Properties > Paper/Quality. You can also replace the regular paper in your printer with recycled paper. I like to save up any paper that I have used (but only printed on one side) rather than throwing it in the recycling bin. That way I can print my PDF pattern on the unused side of the paper! Print the page with the test square first by selecting the page mentioned in the Read Me First document. Measure the test square with a ruler. It should measure exactly 3″. If it does not, your printer still has scaling turned on. Don’t print the rest of the pattern until the square measures 3″. Print the rest of the pattern by printing all pages. If you like, you can number each page in the blank margin so that the pages are easy to keep in order even if they get knocked to the ground by a mischievous cat (speaking from experience…). The pages are like tiles that need to be assembled into a single rectangle before you cut out your pattern pieces. Often times, people that are new to working with PDF patterns try to assemble each pattern piece individually. It is actually less time consuming and more accurate to tile all of the pages so that you are left with one large page – after which you can cut out your pattern pieces. Assemble the pages one row at a time. It is most accurate to assemble each row and then join the rows together. It is a common mistake to try to assemble a PDF pattern one page at a time left to right, top to bottom – this can lead to frustration because any inaccuracies in taping will grow larger by the time you get to the bottom right corner. Assembling in rows is much easier and it doesn’t take up so much space on your table or floor! Continue to tape two or three rows at a time until all pattern pieces are cut out. You will be left with a manageable pile of pattern pieces to trim carefully. I use this method on my dining room table and my outdoor picnic table – it’s very handy because it means I don’t have to crawl around on my hands and knees around a big rectangle of paper on the floor! You can also leave the entire rectangle assembled and trace out the pattern in the size that you need. This way you can roll up the rectangle and store it as a complete ‘master’ pattern so it is ready to use when you want to sew a different size or variation of the same pattern. Alternatively, you can just print out and assemble the pattern any time you need a new copy – that is one of the best aspects of using a PDF pattern! There are many ways that you can store your printed PDF patterns – you can roll them up with an elastic or ribbon or you can fold them up and put them in an envelope or in a plastic insert within a binder. If you fold your pattern pieces, flatten them out before using them again by putting an iron on low heat with no steam. Use a pressing cloth underneath and on top of the pattern piece (so that you don’t melt the tape or transfer the printer ink to your ironing board or iron) and press gently. This is how I store my PDFs – I love being able to rifle through my pattern selection! Categories: Friday Posts, Tutorials | Tags: PDF Patterns | Permalink. All of our PDF patterns now include A0 Print Shop files! If you have purchased one of our patterns in the past, you will have received an email yesterday with a new download link to your pattern. This new download link will give you access to the A0 print shop files (no other changes have been made to your pattern). If you have purchased one of our patterns in the past but have not received an email with the updated pattern link, don’t worry, you can still receive the updated pattern! Just send me an email to info@threadtheory.ca with one of the following: Your order number, an email from us confirming your order, or your old pattern attached to the email as proof of purchase. I will email you the new pattern file! Our original print shop file. Give this file to a print shop that has a 36” wide roll feed printer (these are common in North America). Our new print shop file. Give this file to a print shop that prints on A0 sheets of paper (common in Europe and Australia). A PDF pattern classic. Print this file at home on any printer that can print on letter or A4 sheets of paper. 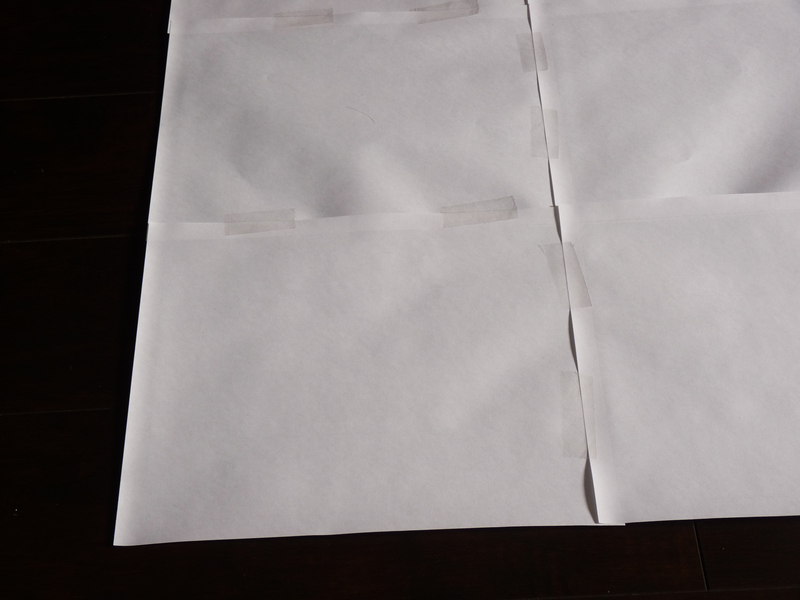 Assemble the sheets of paper with tape or glue (this is a meditative activity for me but can be a little cumbersome for others – hence the print shop options). If you have any questions about using a PDF pattern or sending your pattern to a print shop, please check out some of our PDF specific questions in this FAQ page or feel free to ask away by commenting on this blog post! I will be updating our “How to Assemble PDF Patterns” tutorial soon since it is the very first tutorial that we ever made for Thread Theory – it could use a spring cleaning! With this update in mind, I would love to hear of any stumbling points you might have had when first learning how to work with digital pattern downloads. Or, if you have remained a steadfast user of tissue patterns, I would love to know what prevents you from giving PDFs a try! Categories: Friday Posts | Tags: PDF Patterns | Permalink. Today’s post is a feature on using PDF patterns meant to eliminate the fear that some sewers have of them. I realize that they aren’t the most convenient way to receive a pattern because they must be pieced together but I think they are not as much work as someone who has never used one would think! Actually, compared to printed tissue patterns, the taping process is really the only extra step because it is necessary to cut out tissue patterns just as you would a PDF pattern. Another interesting comparison was pointed out to me by my co-worker, a professional seamstress. She has never used PDF patterns before but when I explained them to her she laughed and said that even though sewers are embracing new technology, to her it just seems like history is repeating itself! She explained that her grandmother used to lay out pieces of paper on the kitchen floor to assemble her quilt patterns. Instead of printing them off of the computer she would spend weeks and weeks collecting them from her local newspaper which offered one quilt square an issue. Each square contain a pattern for piecing or embroidery which could be completed each week while the sewer anticipated the next square. Now that’s devotion! A sample of a vintage newspaper quilt square. I wish this was still a feature of modern newspapers! My tips for using PDF patterns are probably pretty self explanatory to some but I thought I might as well share them in case they will help someone save some time and create a stronger and easier to store pattern. 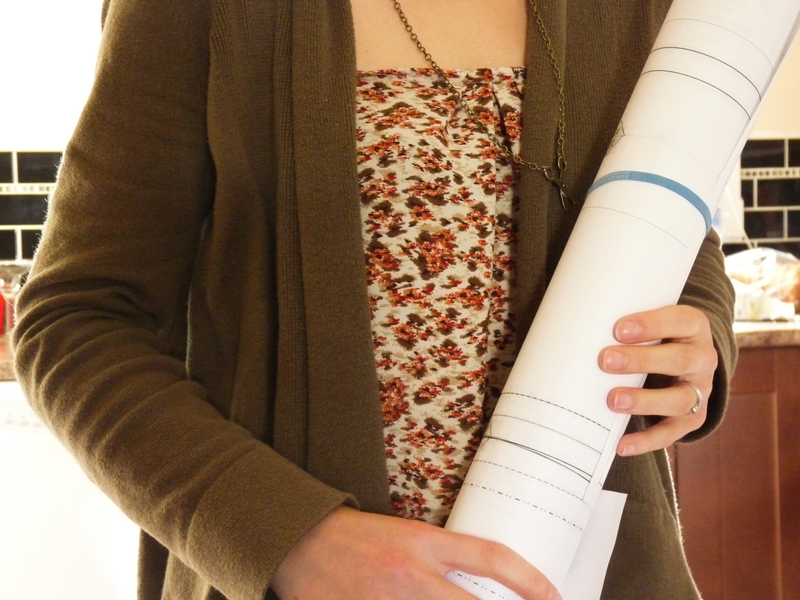 Tape thoroughly: Our patterns print so that the top left corner ends up on the top of your stack of papers. Simply lay out the sheets in rows from left to right. We include a layout sheet and instructions to help you out. I like to cut off one of the margins and tape and overlap all the columns and then piece the four columns together as the last step. For added strength, tape the back of the sheets as well. When taping, you only need to tape areas where a pattern piece extends to the next page – no point wasting tape on blank areas! I simply fold them up crisply in a ziploc bag labelled with the pattern name and size and when I go to use them again I iron them out using an iron with no steam and a press cloth to ensure that I don’t melt the tape. If you prefer, you could always tape the sheets together and, instead of cutting out the pieces, you could trace them using tracing paper (I find white tissue paper works well enough for this but you could also buy the paper designed for this which is available at most fabric stores) and a pencil. Then you can cut out your tissue paper pieces and use those just like a normal pattern. If you are really worried about preserving the pattern you could roll up your un-cut paper pattern after tracing and store it as a tube to re-trace a different size at a later point. Also (though this next option isn’t very tree-friendly), once downloaded you could simply save our pattern and re-print it to use when needed. This would work especially well if you need to use a different size next time. We are considering offering a version of our pattern for download that is a single sheet fit for printing professionally. Would you like this option made available to you? Let us know by leaving a comment and we will prepare it to add to the store!